I liked Marvel’s first entry in these series, Captain America: The First Avenger (2011), and surprisingly, this darker sequel amps up the excitement nicely. 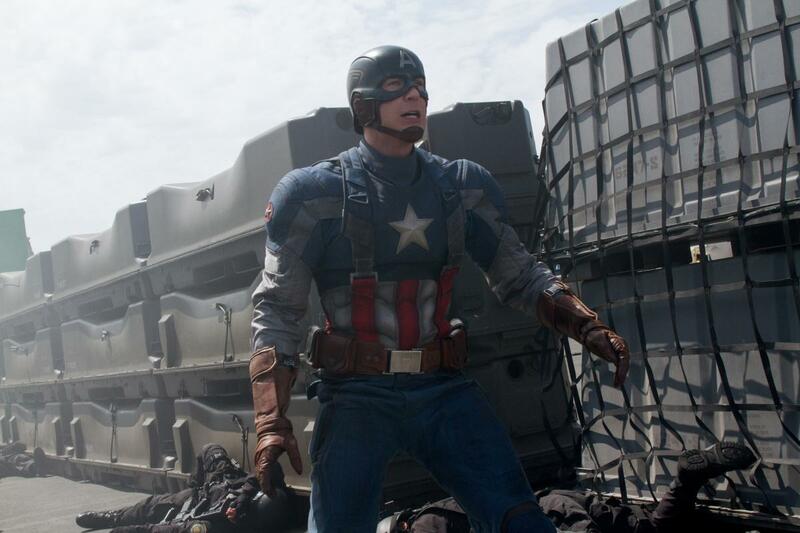 Whereas the first film was an origin story, this one presents Captain America (Chris Evans) as a fish-out-of-water soldier in present-day Washington D.C.. He’s still adjusting to the idea of a modern society where evil is not necessarily an external force (such as the Nazis from the first film or the alien invasion from 2012’s The Avengers), but something that can be found in the fabric of your own government. As he listens to S.H.I.E.L.D. (Strategic Homeland Intervention Enforcement and Logistics Division) director Nick Fury (Samuel L. Jackson) explain the necessity for a new military defense system that can prevent threats before they happen, Captain America responds, “This isn’t freedom. This is fear.” Sound familiar? Exploiting America’s anxieties post September 11 is nothing new at the cinema but it’s interesting to see a superhero film in which the hero is battling the same “patriotism” his name implies. The innocence from the first film is gone, replaced with a Captain America for the era of WikiLeaks, the Patriot Act, and NSA coverups. But no worries. The subtext may be grim, but at heart Captain America: The Winter Soldier is still slam-bang entertainment, with electrifying action scenes, suspenseful moments that seem out of a 70’s conspiracy flick, and a great end-title sequence that may actually be better than the movie itself, a wondrous example of minimalist art direction perfectly fused with Henry Jackman’s propulsive score. As usual, things get a little bombastic for my taste in the final climax. There’s only so many explosions and collapsing metal I can take. But those are minor gripes. And did I mention Scarlett Johansson as Black Widow? I also always enjoy the “hidden” scenes buried in the end credits of each new Marvel film. There are two of these in Captain America: The Winter Soldier, and they point to characters to be explored in the forthcoming The Avengers: Age of Ultron (2015) and – perhaps – a future twist in the Captain America universe. I may not be a fanboy, but damn if this stuff isn’t cool. P.S. And in any case, you should always stay until the credits end. The movie’s not over ’til it’s over!